Asked what I do, I usually answer ‘I fish!’. Because that’s the way it is. I started as a young boy. My father used to drag me to bigger and smaller rivers of the Pomerania region and lakes of the Szwajcaria Kaszubska (Kashubian Switzerland) region – I am from Gdynia, so it was nearby. Of course, as every youngster, there were times when I discovered ‘wine, women and song’, which took some time out of my life. I quickly returned to fishing, however, because, first of all I left for Sweden, and, secondly, I got married. Two years passed and I decided to do something about my wife’s constant complaint: “You and your bloody fish”… and that’s why I became a fish guide. No wife will tell you “You and your bloody work!”. There is a grain of truth in this story. As a matter of fact, this was my dream and when some Swedish guides I knew invited me to cooperate I didn’t think for a while! 15 years have passed since then, filled with gaining experience on different waters all over the world. The skerries, however, are my favorite fishery because you won’t find such water anywhere in the world. 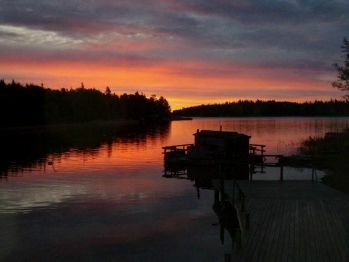 I fish most often on the skerries near Stockholm: about 200 km of shores, where the glacier messed up leaving about 30,000 islands, isles, bays, necks between islands, many underwater hills and big depths , etc… You name it! There are wonderful pike, perch, sander, trout and of course salmon in this water. 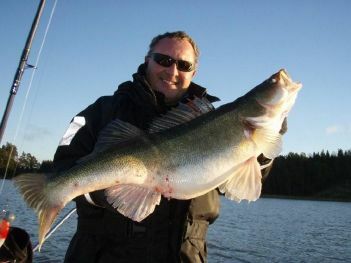 I also love Sweden’s big lakes, including Mälaren where I have my pike fisheries, and Hjälmaren which is full of sander. The sander caught with rubber bait is my favorite spinning target. 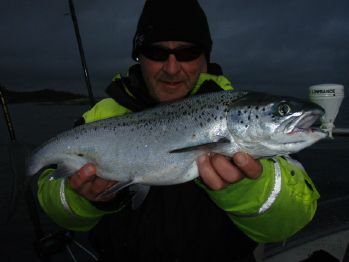 I also fish very often on the Vänern and Vättern lakes, where I mainly do trolling to catch salmon and trout, as well as huge Arctic trout. My basic method on numerous fisheries is the spinning of course. I fish mainly using big rubber and jerk bait. However, I use spoon lure from time to time, the bait which has recently been slightly forgotten. All this takes place in my ‘well-armed’, comfortable and fast boat which manages in nearly all weather conditions. I have never given up fishing because of strong wind or big waves. My boat manages all these. My guests include not only professional hunters looking for big fish but also total amateurs who want to have a nice adventure in the water with a fishing rod in their hands. I also try to adjust the fishery and the method to the skills of my boat companions. My biggest reward is the success of my guests! I believe that there is no fisherman who knows everything, so no one is ever bored. I should also add that I have been a TEAM DRAGON member for many years. Sometimes, I write a text for fishing magazines or I make a film on fishing. The Hjälmaren lake is located in southern Sweden. This is a big lake – the fourth biggest water reservoir in this country. Its surface amounts to about 484 square km and its length to about 60 km. The Hjälmaren is a beautiful lake, round-shaped, with a substantial number of islands. The lake is surrounded by woods, meadows and swamps full of birds and wild animals, which are a vast natural park. There are many holiday homes at the lake but they are dwelled mainly in the summer season, i.e. in July and August. Out of season, there is peace and quiet over there. 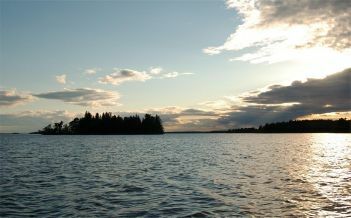 Despite its size, the Hjälmaren lake is relatively shallow. Its maximum depth amounts to 22 meters but its average depth is about 6 meters. There are lots of underwater rocks, stones pointing out of the water, as well as charming reedy bays covered with water-lily leaves in most parts. These places are ideal pike seats, while the pike is the most popular target of anglers coming here. 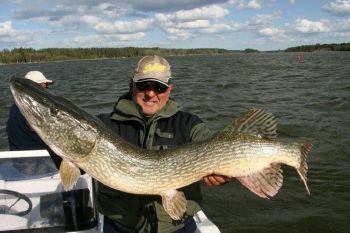 In some periods, especially in May and late in fall, when the underwater plants don’t make fishing that hard, you may count for real pike-harvest while fish of over 100 cm are not rare. Apart from pike, the sander and perch are very popular here. 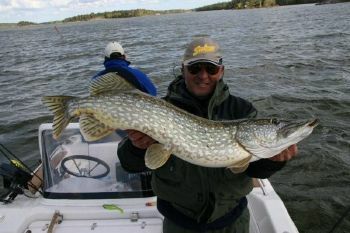 Especially in the warmer months, they are an attractive supplement to the pike. Feel invited to come to this beautiful lake. Our guide, Tomasz Krysiak, has his big, fast and safe boat here. The boat is fully equipped with fishing stuff and electronics (echosounder, GPS). 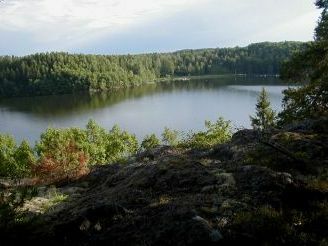 The Mälaren is Sweden’s third biggest lake. Its surface amounts to 1,140 square meters. The lake is located in the south and surrounds the whole city of Stockholm. Mälaren splits the city into several parts. Its maximum depth amounts to 60 meters. The lake is deep in general but it has many shallower bays and many sections with shallow even bottom or shallow reedy spots. On the lake, there are lots of islands which are good fisheries for preying fish. 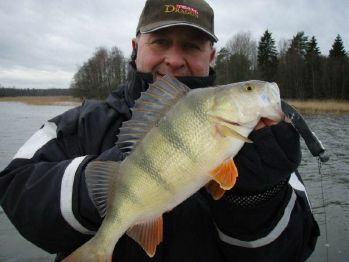 One may mainly counts on successful pike and perch fishing on the lake. Mälaren is connected with the Baltic Sea and another big lake, i.e. the Hjälmaren. The lake’s shore is very differentiated. The bottom is full of underwater hills, depths, flat and shallow parts, it’s really very interesting from the angler’s point of view. Feel invited to fish on this big lake. Our guide, Tomasz Krysiak, has his big, fast and safe boat here. The boat is fully equipped with fishing stuff and electronic appliances, including echosounder and GPS. Skerries near Stockholm are about 200 km of shores. Skerries were made by a glacier which left about 30,000 isles, rocks, bays, necks between islands, many underwater hills and big depths when it was shrinking. Skerries are the result of constant piling up of the land. On the skerries near Stockholm, very differentiated flora and fauna live. Bigger inner islands are full of dense coniferous and leafy woods. They are seats to bigger mammals and a vast number of wood and water birds. Smaller islands which are common on the outskirts of the archipelago, are covered with low plants and have a more austere, northern image. Stockholm skerries are a true natural park full of very clean water and untouched nature. In the waters of Stockholm skerries, there are many fish types, first of all great pike, perch, sander, trout and salmon of course. On Stockholm skerries, we GUARANTEE that you fish from a very big and fast boat with a strong engine, which lets you fish in any weather conditions! The boat may take 4 fishermen onboard and is equipped with full sea electronics – GPS sonar and echosounder. The boat is equipped with full fishing stuff as well. If you want to fish with our guide, Tomek Krysiak, you don’t have to worry about anything. You may go without your equipment or suitable clothes. Our guide guarantees fishing suit and full fishing equipment included in the price of fishing.